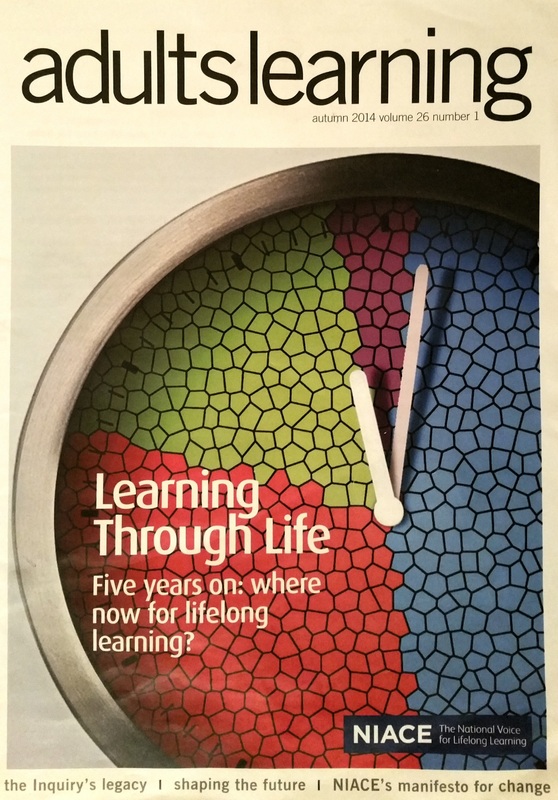 The autumn edition of adults learning reviews where we are five years on from Learning Through Life: Inquiry into the Future for Lifelong Learning. NIACE built on the report’s findings in its manifesto for the upcoming general election, Skills for Prosperity. Its overarching drive is to resolve investment in a framework for lifelong learning by employers and individuals, as well as government. In particular, addressing the skewed investment in young learners towards ongoing life course and workplace productivity. A key suggestion for managing this is via a national system of ‘learning accounts’ which would include periodic career review, a better system of credit transfer and accumulation, and decentralising to an as yet unclear ‘localism’. Concern is expressed at the significant reduction in investment overall, in mid-level and part-time courses, and reduced social mobility and well-being. In the opening Commentary David Hughes, Chief Exc. NIACE emphasises the now urgent need to create a new model of the educational life course based on a ‘stage’ rather than ‘age’ approach. David Watson and Tom Schuller, authors of Learning Through Life, assess the legacy of this widely acclaimed report which quantified the value of post-compulsory education and training in the UK at between £55 and £93 billion. It conceptualised learning as a human right and “set out a framework of opportunity, structured around investment, incentives and capabilities” (p.6). The agenda was to be shaped via ten recommendations. The rest of the edition looks through the eyes of experts at each of these recommendations in turn, before concluding with a retrospective from Alan Tuckett and a summary with the implications for the manifesto from Tom Stannard. These key stages are proposed as being up to 25, 25-50, 50-75 and 75 plus and respond to “an ageing society and changing patterns of paid and unpaid activity” (p.6) over the life course, with different priorities for development and competence in each life stage. The interplay of life, skills and learning across life courses demonstrates a requirement for accessible adult learning at a range of points, the benefits of which are demonstrated by recent research. Funding has been biased heavily towards young learners starting out in life, and away from the growing pool of elders. The lack of such a carefully planned four-stage provision has led to a phenomenal drop in mature and part-time participation in study, made worse by funding constraints. At the same time, the effects of recession on under-thirties economic activity and in turn their health and civic life is perceived to portend social disintegration. Karen Evans believes that effective lifelong learning in an integrated policy approach will lead to a rational rebalancing of the resources. This rebalancing is to “reflect a coherent view of our changing economic and social context” (p.7) where planning in a very slight redistribution across later years would be paid for by an anticipated reduction in the number of young people over the next decade, and in addition to economic investment, would support social engagement and wellbeing. The move towards loan-funding in higher, and now further, education appears likely to be more expensive than the system it replaced, while contributing to a collapse of mature and part-time learner numbers. In parallel there has been an increase in older learners participating in private and online learning, particularly those who have remained in work. A pilot of mid-life career reviews via the National Careers Service proved very successful, and older people are more likely to be beneficiaries of community learning initiatives. These would include recurrent opportunities to universal entitlements such as basic skills, access to IT, and thresholds into lifelong learning at key life points or events. It is argued that the State should provide this at least to level 2 and free at point of use. At higher levels, there is a suggestion of redeploying corporation tax relief for training or redundancy measures into granting ‘learning leave’ from working life, for example. Union Learn has been a successful model of employer employee training engagement, mirroring the successes of a range of models in other organisations. Funding via grants or tax rebates are other possibilities, beyond subsidised loans. Personal Learning Allowances should draw on the successes of the Individual Learning Accounts whose implementation failed in England but flourished in Scotland and Wales. Argues for funding that mirrors and supports this form of provision and removes the perceptual bias towards full-time learning. This might for example fund credits rather than qualifications, be ‘mode’ free, and integrate in-house employer training. A credit-based system is a learner-centred system as it centralises choice. Limited progress in the vocational Qualifications and Credit Framework (QCF) is not translating across to schools, higher and professional qualification frameworks and therefore does not currently enable learners across post-compulsory education. Notional equivalency in loans for part- and full-time learners did not translate in practice as it ignored the other forms of support, presuming part-timers’ sufficient employment income to fully subsidise living and study costs, only covering around a third of prospective part-timers, and leading to a 46% fall in participation. Maturer learners attempting to re-skill laterally are penalised across a number of fronts, whilst being most likely to have to balance these compromises against more pressing work, home and family commitments. Equally for institutions, part-time provision is riskier than full-time. The reduction in part-time vocational sub-degrees and shorter modules leading to credit has been most pronounced in prestigious and research intensive institutions, focussing on full-time bachelor study. The system has become less flexible. By focussing on how skills are used (rather than increasing ‘volume’) e.g. at work, acknowledging the need to “bring supply and utilisation into some kind of relationship” (p.8), and with equity of access to training across the status ladder. A significant percentage of the workforce is recognised as being over-skilled and/ or over-qualified for their current role implying stagnation, worsened by the finding that “work that allows limited discretion and room for decision-making and creativity is more stressful and can pose serious physical and mental health risks.” (p.19) Keep queries the assumption that a proliferation of qualifications (previously reserved to a privileged subset) equates to society as a whole upskilling (and deriving equivalent benefits). He draws attention to the conflict around recognition of the value of qualifications in women, whose careers are more likely to incorporate career breaks. Recent job creation includes a significant increase in insecure and unpaid activity contributing further to income polarisation. Creativity and innovation may not be acceptable in many jobs, which in turn may generate transactional rather than transformational employee relations. The UK does not score well on high proportions of high skill work across workplaces; nor on workers participating in discretionary learning to the same degree as managers. However there are projects which have addressed quality of work and one example is of the Scottish Funding Council which is funding the undertaking of twelve diverse experimental ‘proof of concept’ pilot projects between business and academia on effective skills utilisation, which promotes high performance work practices and innovation. This would incorporate a common core such as digital, health, financial and civic capabilities with local and contextual customisation. These are found to have transformational impact on the lives and community activation of participants, where critical thinking, communication, collaboration and creativity are developed, and local networks work together. The initiative has been pressed by cut backs and wholesale systemic change across services such as health and digital learning over the last few years. However some examples of initiatives in community learning do exist. In the light of a 35% funding cut in adult skills and the removal of teacher qualification requirements, there has been significant growth in private providers, with quality determined by the market. The Qualified Teacher Learning and Skills (QTLS) initiative has not had the predicted take-up and The Education and Training Foundation (ETF) is currently overseeing a period of less support for individuals’ investment in their competences, and less pressure on employers to use professionally qualified staff. However, revised simpler standards guiding Initial Teacher Training (ITT) and Continuing Professional Development (CPD) have enabled diverse positive change and 80% of the teaching workforce hold or are working towards teaching qualifications. A positive impact has been demonstrated on the workforce, and in parallel union learning activity is developing professional identity through paradigms of ‘democratic professionalism’. Strategic local capacity has been lost with recent waves of change and there is a call for strategy-making by local authorities, autonomy of FE colleges, local employer networks, roles for cultural institutions, and appropriate learning spaces connecting learners with teachers. Britain’s ten core cities hold approximately a quarter of the population, generate 27% of the wealth, and demonstrate the range of local specialisms which impact on skills demands. They have also shown how local councils owning skills impacts on effective local economy demand-led provision, including in youth employment and welfare to work. The four nations give opportunity for experimentation and comparison for best practice in determining national strategy in frameworks for lifelong learning, within the international context. But lack of coherence in approach is still evident at ministerial level. A single government department is argued for, and an independent overseeing body. While political structures exist from European Union level down through national to within member nations in the oversight of adult learning, it is among providers that networks are stronger. Field points to the need to listen to learners on policy, as is done in Scotland, in order to figure out how ‘to advance the common interests of learners in a chaotic and dynamic world.’(p25) Narrowing to a focus on the common interests of learners appears the only likely course of advancement. This system needs periodic review with consistent information and evaluation generating debate. The strength of Learning Through Life was that it took an overview of all lifelong learning activity across the nations informal, non-formal and formal, unlike direct government funded research and development where ‘the imperative in government has been to fund support for research into existing policies and programmes… with a strong emphasis on making current policies work, rather than asking whether they were good ideas in the first place or how they affect other parts of the system’ (p.26) There is a call for systems-wide leadership to remedy the fact that Schuller and Watson’s 3-year reports have not yet been carried out. This article gives background on developments in Adult Education to the point of the 2009 Schuller and Watson report, and gives a view on where government policy is now going with this area of learning. It is very useful for researchers who need to draw on background to the Learning through Life report. The impact of Learning Through Life was undoubtedly reduced due to being published too close to a general election to impact on proposed policies, intentionally not carrying specific recommendations for providers to get on with in the meantime, and having a minimal dissemination and promotion budget associated with its launch. The most influential reports in education, however, have made themselves felt over years if not decades, and this independent report as a culmination of three years of research by officers from NIACE and UNESCO is as relevant and illuminating today as when it was published in 2009. And on that note, this issue of adults learning concludes.